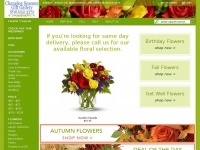 Order flowers online with Same Day Delivery from Changing Seasons Gift Gallery. Fresh flowers and hand delivered right to your door. Experience the Teleflora difference! 10. Love & Ro­man­ce /in­de­penden­ce-flo­rist/love-ro­man­ce-flo­wers-6289c.. The web server used by Changingseasonsflowers.net is run by Linode and is located in Absecon, USA. There are many websites run by this web server. The operator uses this server for many hosting clients. In total there are at least 1,803 websites on this server. The language of these websites is mostly english.